Laxton Hall Fun Day 2019 will take place on the 22nd June 2018. Laxton Hall Fun Day 2017! You can download and print these posters for your school or organisation here (yellow), here (red) and here (blue). This year, the Laxton Hall Fun Day will take place on the 17th of June 2017. There are some new attractions planned for his year’s Fun Day. Firstly, we are delighted to announce that this year, the Fun Day will happen under the patronage of the Polish Football Association! This means, amongst others, some very special prizes awaiting our Football tournament champions! Additionally, the games will be observed by one of the Association’s professional players! Another novelty will be the Animal Farm and a fishing competition! There is also something special planned for the parents: there will be a talk for them, explaining the benefits of bilingualism and some tips on how to best support the development of your bilingual child. The Fun Day’s Rules and Regulations 2017 can be seen here (in Polish). The entire profit from the coffee shops and the barbecue will be donated towards the organisation of the Laxton Hall Fun Day 2018. We look forward to seeing you in Laxton Hall! Taking part in the Laxton Hall Fun Day is free and it is open to all the Polish children (or those of Polish origin) together with their parents and teachers as well as for the whole families. As organisers, we require you to follow The Laxton Hall Fun Day rules (in Polish). Larger groups from the Polish Saturday Schools or other organisations are requested to send us an e-mail to the address shown in the header of this page. Please state where your group will be coming from and the approx. number of attendees. This information will help the organisers to prepare well for the event. 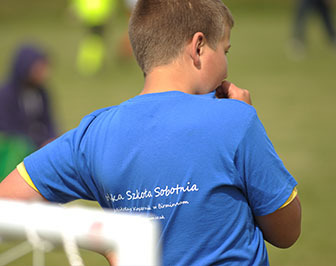 The Polish Saturday Schools that wish to take part in the group tournements, such as football, are requested to send an e-mail with this information to the address shown in the header. If your students wish to take part in the individual contests, you don’t need to let us know, they will sign up on the day. Please, see the map here. Please, see the location plan showing locations of sports activities, games and competitions.